Make a house a home with one or even two of our lovely cushions. Made from a lovely selection of fabrics, some of which are appropriately doggy themed, these cushions will freshen up your home. They make perfect additions to your sofa or you can use them out in the garden on a nice sunny day. We also have luxury dog cushions which can be personalised with your dog's name and breed. 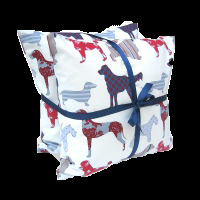 At Chelsea Dogs, we have found some wonderful cushions that will look great in your home. Choose from our beautiful Black Labrador print cushion or our Scottie Dog cushions available in two colour ways. If you are looking for something a little more special, our personalised dog cushion is bound to suit. First, choose your fabric colour from a fabulous selection of fabrics and then choose your breed of dog which will be added to your cushion in a choice of black, white or brown. We can even add your dog’s name to the cushion with a cute paw print motif. All our luxury dog cushions are handmade to order for us in the UK by the wonderful Annette’s Allsorts, Penny Belle and Chic Shack.